Reverse osmosis is a pressure-driven desalination technique that is generally used to remove water from a solution. This month's Back to Basics article covers the basics of the technology and provides guidance on troubleshooting performance issues, cleaning, and more. Other topics in this issue include visual PHAs, intermediate bulk container safety, and water use optimization. 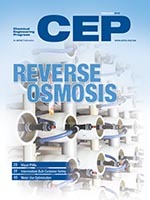 Reverse osmosis (RO) is used throughout the chemical process industries (CPI). Review the basics to understand best practices for troubleshooting, monitoring, and cleaning. Although composite intermediate bulk containers (CIBCs) provide ease of storage and transport, they pose a unique fire hazard that is often overlooked.